Figure 1. Components of an atom. Figure 3. 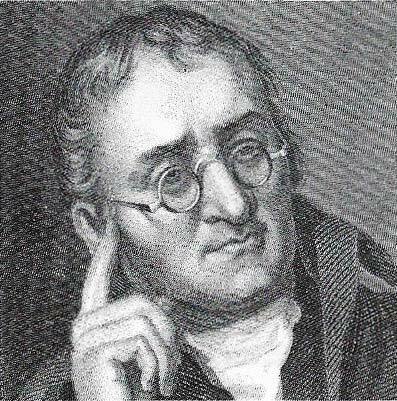 John Dalton, the son of a weaver, is one of chemistry's most distinguished figures as a result of his work on the atomic theory. He was born in Cumberland, England, in1766, into a Quaker family. At the age of 12 he became a schoolteacher. He moved to Manchester in 1793 and stayed there until his death in 1844, earning his living by teaching mathematics and natural philosophy (physics). Dalton was color-blind and in addition to the atomic theory, which he developed during the first decade of the 1800s. He also investigated color-blindness (sometimes called Daltonism) and meteorology. Figure 4. 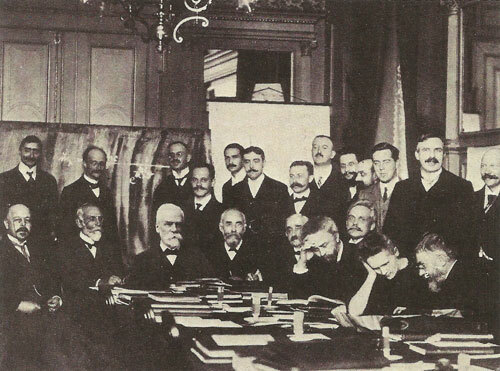 The new ideas about atomic physics were brought together at a series of conferences, such as this Solvay meeting at Brussels in 1911, attended by Bohr, Rutherford, Planck, Curie and others. Figure 5. Lines on the spectrum can be observed in light given out by incandescent elements. These are emission lines, which result from the emission of light by atoms. One of the successes of the Bohr theory was its ability to explain the wavelengths of the lines in the spectrum of hydrogen in terms of electron energy level changes. Figure 6. Possible orbits of an electron around an atomic nucleus can be pictured [A] as circles that exactly accommodate a whole number of wavelengths, denoted by the principal quantum number n. A two-dimensional analogy (a vibrating drum skin) is described by two quantum numbers n and l [B], and the shape of a real atom [C] in terms of three, (n, l and m). An atom is the smallest particle of an element that can take part in a chemical reaction. An atom consists of a nucleus, containing positively charged protons and uncharged neutrons, which is surrounded by much lighter, negatively charged electrons (see Figure 1). The number of protons is equal to the number of electrons so that, overall, an atom is electrically neutral. 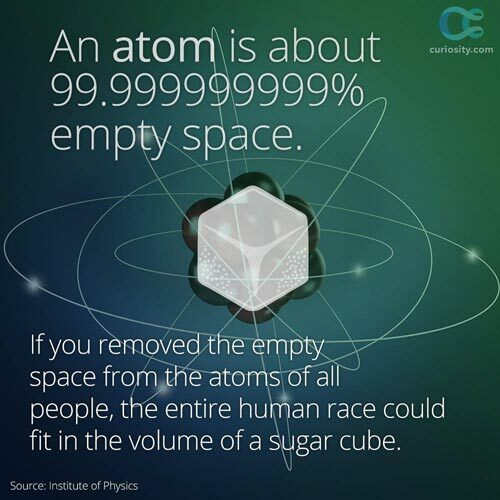 Atoms are inconceivably small. A normal drop of water contains about 6,000 quintillion (a 6 × 1021) atoms. The diameter of an atom consisting of a nucleus and orbiting electrons is approximately one hundred millionth of a centimeter (10-8 cm). The diameter of the nucleus is approximately ten trillionths of a centimeter (1 to 5 × 10-13 cm). The nucleus is therefore 100,000 times smaller than the surrounding sheath of orbiting electrons (see Figure 2). Different kinds of atoms result from the combination of different numbers of protons, neurons and electrons. The number of protons in an atom is its atomic number, and the total number of protons and neutrons is the mass number. The simplest atom, that of hydrogen, consists of a single proton and a single electron. If a neutron is added to the nucleus of hydrogen, a different kind of atom, called deuterium, is formed. In many ways, the behavior of hydrogen and deuterium is the same – as one might expect of two atoms each with only one electron. As a result, the hydrogen atom with no neutron (sometimes called protium) and the deuterium atom are classed by the chemist as being different isotopes of the same element. There is also a third isotope of the element hydrogen. This is tritium, with two neutrons and one proton is its nucleus. But if a second proton is added to a tritium nucleus and, to balance the electric charge, another electron is placed round this nucleus, the situation is quite different. The atom shows no resemblance in its chemical behavior to any of the hydrogen isotopes. It is an atom of an entirely different element – helium. From the days of Democritus onward the atomic idea in a vague form appeared at intervals. Robert Boyle and Isaac Newton used it in their physical speculations, but at the beginning of the 19th century, John Dalton made it into a definite quantitative theory, based on the numerical facts of chemical combination (see Figure 3). Ancient Greeks, such as Democritus, believed that matter is made from tiny particles, which they called atoms. But 'atomism' did not become a useful part of chemistry until John Dalton proposed that atoms have different weights, and that the weight of any particular atom is constant. 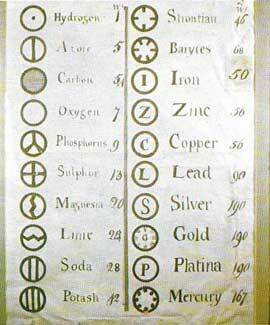 By 1808 Dalton had drawn up this list of symbols for the different types of atoms (elements). Antoine Lavoisier and others had proved that a chemical compound, however obtained, is always made up of the same amount of the same constituent parts – water, for instance, always consists of one part of hydrogen combined with eight of oxygen, giving 8 as the "combining weight" of oxygen. Nevertheless, some chemists, among them Berthollet, did not believe in this constancy. But John Dalton saw that the properties of gases were best explained by atoms, and then pointed out that, on this theory, the combining weights in chemical combination gave the relative weights of the atoms also. He drew up a list of 20 such atomic weights (see relative atomic mass). This formulation was too simple; Dalton thought that, if only one compound of two elements was known, it was fair to assume it was formed atom for atom. This is not always true, indeed it put Dalton wrong about water. i.e., two atoms of hydrogen combine with one of oxygen to form one molecule of water. Oxygen is therefore said to be a divalent element. The concept of valence has been much used in chemical theory. From the considerations given above it follows that the atomic weight of oxygen is not 8 but 16. Thus Dalton's combining weights need to be considered in the light of other experiments before we can assign to the elements their true atomic weights. This was first done systematically by Cannizzaro. A connection between atomic weights and physical and chemical properties was sought by several chemists, the most successful being the Russian Dmitri Mendeleyev. On arranging the elements in order of ascending atomic weights, a periodicity appeared, each eighth element having somewhat similar properties. The resulting periodic table gave a means of assigning correct atomic weights to elements of doubtful valency. Blanks in the table were filled hypothetically by Mendeleyev, who thus predicted the existence and properties of unknown elements, some of which were afterwards discovered. As measured chemically, many elements (but not all) have atomic weights approaching whole numbers. This suggested to Prout and others that all elements were composed of hydrogen, or at all events of some common basis. But this idea was beyond the theoretical and experimental powers of the time to test. The simple Daltonian view of the atom was overturned in 1897 when J. J. Thomson discovered that atoms could emit even smaller particles of negative electricity (later called electrons). Clearly the atom itself must have some form of internal structure. Thomson's discovery also implied that an atom must also contain positive electricity. He suggested that electrons were like currants dispersed throughout a positively charged bun. This model failed to explain a number of the properties of atoms, but a better one had made use of the discovery of radioactivity by Henri Becquerel. He found that certain heavy atoms spontaneously emit radiation. Three forms of this are now known: beta particles (negatively charged electrons), alpha particles (positively charged helium nuclei consisting of two protons and two neutrons) and gamma rays. In 1911 Ernest Rutherford produced an entirely new model of the atom based on the results of his own experiments and those of Hans Geiger and his coworkers (who measured the scatter of alpha particles when shot at gold foil). Rutherford's suggestion was that the positive charge and most of the mass of the atom were concentrated in a central nucleus and that the electrons revolve around it (see Rutherford's experiment and atomic model.) We now know that the atom is mostly empty space with a minute central nucleus some tens of thousands of times smaller than the atom. The atoms themselves are extremely small – ten million of them side by side would form a line measuring only about 1millimeter (0.039 inch). Rutherford later discovered that the positive charge of the nucleus is carried by particles 1,846 times heavier than electrons; he christened them protons. The charge of the proton is equal, but opposite, to that of the electron. A hydrogen atom consists of a single positively charged proton (the nucleus) with one electron travelling in an orbit around it (see Figure 4). 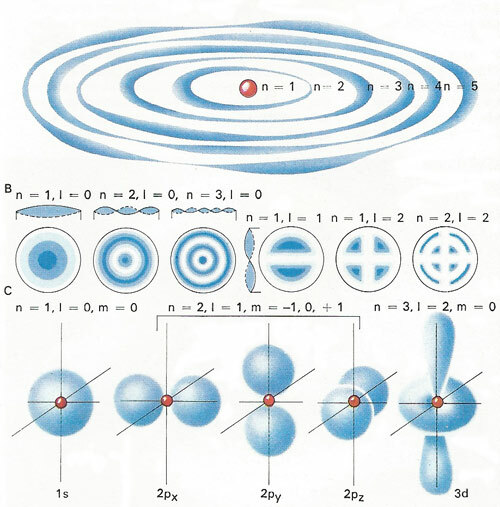 Heavier atoms have increasing numbers of protons in their nuclei, but the number of protons in the nucleus (called the atomic number) is always balanced by an equal number of orbiting electrons. It was later discovered that all atoms except hydrogen have another type of particle in their nuclei. These are uncharged particles (and are therefore called neutrons) and they have almost the same mass as the proton. Two other fields of investigation helped the Danish physicist Niels Bohr to construct the next important atomic model. The first was quantum theory, the other was the science of spectroscopy (see Figure 5). Quantum theory was proposed by Max Planck (see Max Planck and the origins of quantum theory) in 1900 as a way of explaining the emission of heat (and light) by a hot body. He realized that energy can be emitted and absorbed only in discontinuous amounts, discrete "packets" of energy that he called quanta. Spectroscopy began when Isaac Newton passed a ray of sunlight through a glass prism, breaking the ray into all the colors of the visible spectrum. In 1814 Joseph von Fraunhofer had discovered that the spectrum of sunlight contains a number of black lines, which were later found to coincide with the position of colored lines in the spectrum formed by electric discharge in hydrogen gas. Bohr postulated that the circulating electron in an atom of hydrogen can exist only in fixed orbits and that the spectral lines correspond to the absorption or emission of a quantum of energy when this electron jumps from one fixed orbit to another. 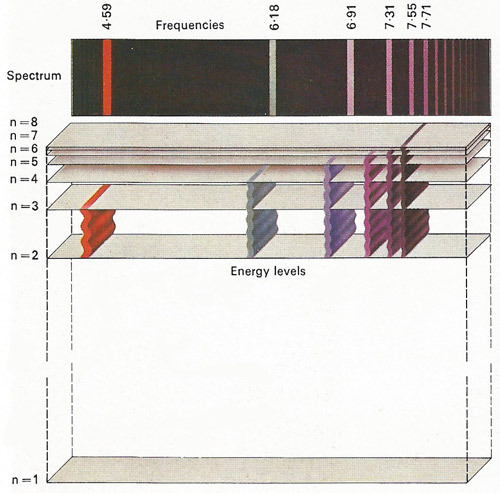 This theory, later modified by Arnold Sommerfeld (1868–1951), has been extremely successful in explaining the hydrogen spectrum (see Figure 6). Modern developments of the quantum theory suggest that the fixed orbits of Bohr should be visualized less precisely and that the position of an atomic electron should be treated as a probability that it will be in a certain place at a certain time. This treatment, known as quantum mechanics, was largely the work of Werner Heisenberg and Erwin Schrödinger. The substitution of a probability for a fixed orbit is a reflection of Heisenberg's uncertainty principle: if the momentum of a particle is known precisely there must be an uncertainty as to its position. According to the idea known as wave-particle duality, In wave mechanics, matter in the form of atomic particles can sometimes be best explained in terms of particles, and at other times in terms of waves (see de Broglie and matter waves). A stream of electrons behave like particles in cathode rays and like waves in an electron microscope. But for the purposes of chemistry the concept of the atom as the smallest unit of matter that can take part in reactions remains supreme.